Everyone needs their alone time and if you’re a mom like me you know this is how you stay sane! Today I’ve put together a little list of things I do when I need some “me-time.” I try to do at least one of these everyday so that I can be a better wife and mom to Aria and Blake. 1. Take a bubble bath! I crave bubble baths especially after a long day. 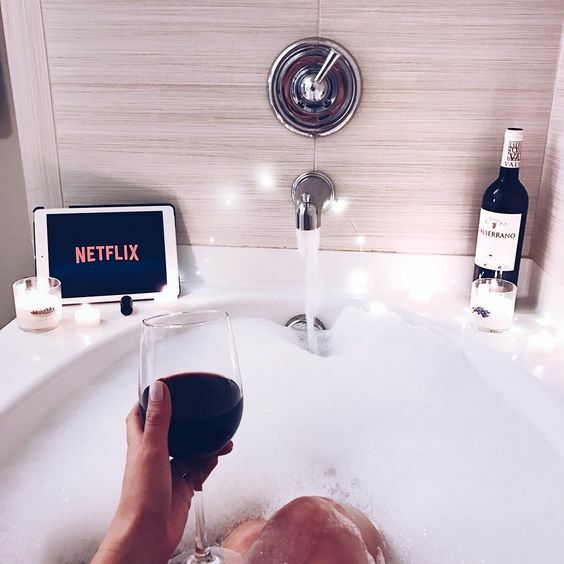 When I can, I lock myself in my bathroom, listen to music, drink some wine and soak for probably way too long haha. It always makes me feel relaxed and ready for a good night’s sleep. 2. Read a book. I’m not a huge book-reader but I try/ want to be… if that makes sense haha. I love reading if I love the story. Give me all the romance novels, please! Here are some books I’ve read or heard were amazing! 4. Organize something. This may not be for everyone but I really enjoy organizing. It’s therapeutic for me! 5. Watch one of my favorite shows… with popcorn! By now, you probably know how much I like to watch my favorite shows and movies (see my netflix faves here) and somehow if I add some buttered popcorn it makes it a little more official haha. Speaking of retail therapy, these are my favorite pieces I’ve seen online recently! Have fun and thanks for stopping in to read!